On February 2, the Senate Health, Education, Labor, and Pensions Committee will hold confirmation hearings for Andrew Puzder, Donald Trump’s choice to head the Department of Labor. Puzder is the CEO of CKE Restaurants, which owns Carl’s Jr. and Hardee’s fast food restaurants and employs thousands of workers across the country. Throughout his career, he has been an outspoken critic of labor regulations and government programs that provide services to the poor. But lately, Puzder has also backed lobbying tactics that extended beyond politics as usual: until recently, the multi-millionaire CEO belonged to the Job Creators Network, or JCN, a group that helps corporations push anti-regulation messages on employees at work in order to influence their voting preferences, a practice the organization calls “Employer to Employee” (E2E) policy education. Job Creators Network boasts that the group’s political messaging has the ability to reach more than 60 million employees across the country. In training materials, JCN encourages employers to send their workers a steady stream of emails and letters about policies that affect businesses, as well as to place posters and fliers around the workplace and to stuff paycheck envelopes with political material. The group also advises employers to expose workers to political messaging during break hours and to hold town-hall-style meetings or screen policy videos. 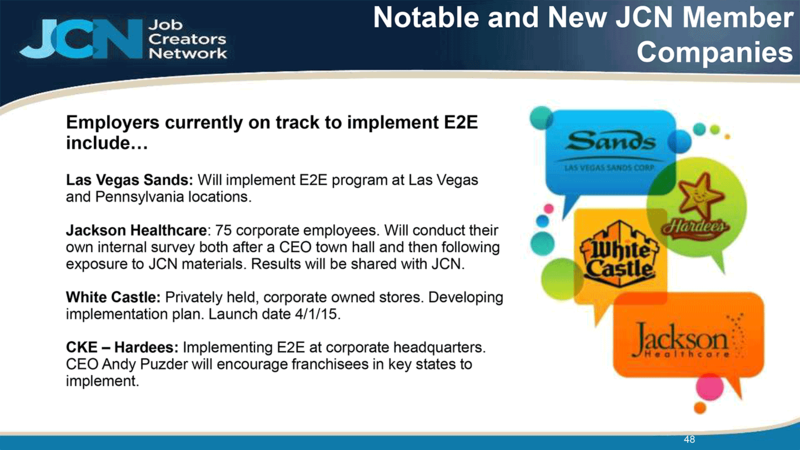 CREW obtained the slide presentation after JCN materials were uploaded to two industry websites, including of the law firm of Baker Donelson, which hosted a conference in New Orleans in April of 2015 that JCN participated in, according to a press release. The material has since been taken down from the websites, CREW told The Nation, although another version remains available at Baker Donelson.